Musical ensembles tend to run like dictatorships; the director's opinion comes first. Don't like it? Too bad. C4, a new choral group, is trying a new business model: a collective. A collective is a group made up of the whole of its parts; a business owned and operated by its members. Everyone has equal footing and can collaborate on the most democratic level. So far, C4 is a group where the members hate missing a rehearsal, a group that's breaking the mold while enjoying the artistic process. 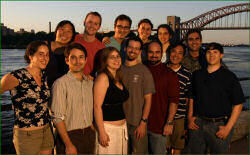 The idea began when Ian Moss, a vocalist, composer and Yale University graduate, sang in 2003 with the Canticum Novum Singers, a highly-skilled avocational New York choir directed by Harold Rosenbaum. Harold invited a few singers interested in conducting to his house for a workshop with singers and to have the group sing music he had on hand. Wanting to continue working on singing and conducting, Ian and others at Harold's workshop were struck with an idea to have a casual vocal group get together occasionally, on their own. The group never got off the ground due to logistics, but it got the ball rolling in Ian's head about a collaborative vocal ensemble. Trying some ideas out on friends and colleagues from Canticum Novum and Cerddorion, another vocal ensemble in New York, he came up with a plan that involved singers, conductors and composers, an idea that didn't include himself as the musical ring leader. He wanted the group to have life outside of any one individual and to give the members, and possibly others, a chance to develop skills such as choral conducting that would be hard to come by without an organized, willing group. "I realized I was taking a different direction than the original plan," said Ian. "That's OK. This could end up being a really important way of adding a new voice to the choral landscape. In my experience, I hadn't come across any comparable setup. It really was this democratic situation instead of having one music director lead the group with their vision." It didn't take much coercing to get interest. People were drawn to the idea that their opinion would be heard in everything from the choice of members to the final concert. When the group was molded, the collective included a combination of past colleagues and auditioned members with multitalented backgrounds as professional and amateur performers, aspiring conductors and published composers. In January 2006, the first-ever Choral Composer/Conductor Collective started rehearsing and gave its first concert on June 9 with 14 members in the chamber chorus and 26 in the symphonic chorus. Norwegian Seamen's Church echoed that evening with a wide range of works in up to 18-part harmony by Eric Whitacre, Paul Carey, Franny Geller, Eddie Rubeiz, Karen Siegel, Alexander Dmitriev, Ian Moss, Joan Panetti, Jonathan David and John Christian Rommereim. Half of the composers were members of C4 and the night included four world premieres. All music was chosen by consensus of the group. "The one thing that pulled everything together for the first concert was this is all music we really loved," said Ian. "People would bring things in and if we loved it, we would program it. I think that was refreshing for a lot of people in the group because when somebody else is choosing all the repertoire, chances are you'll like some of the stuff, but chances are there are a few pieces that you're just not as invested in. In this case, there was a really high percentage of people who liked the music, who really believed strongly in the music we were doing. It's unbelievable to have that kind of energy because it really trickles down into every aspect of what you're doing." "My favorite thing about C4 is that the board and the chorus are one and the same," said Franny Geller, a core member of C4. "The care and efficacy with which we carry out business is always an inspiring reminder of the importance that performing new music holds for each of us." C4 continues this year with a concert on January 26 at the Norwegian Seamen's Church at 317 East 52nd Street, New York, NY. The group will include a few new faces from recent auditions and they've already begun the collective process with a retreat in the Catskills. At this time, the repertoire includes music set from humorous texts collected from blogs, D.H. Lawrence and Federico Garcia Lorca poems, and a piece based on dialogues from David Lynch's movie Mulholland Drive. International composers will also be represented with music by Swedish composer Victor Strandberg and Norwegian composers Trond Kverno and Egil Hovland. Updates and additional information can be found at www.myspace.com/c4ensemble. Anna Reguero plays the clarinet and is a graduate of the Eastman School of Music. She received her graduate degree in Arts Journalism at the S.I. Newhouse School of Public Communications at Syracuse University. Currently, she is the editor of the Journal of the Conductors Guild and is a freelance writer and musician in New York City. Revision Date: October 20, 2006.